The equinox is here. Persephone is about to make her first journey into the Underworld. She just doesn’t know it yet. The new version of your Literotica favorite is now live on Amazon. AND, if you have Kindle Unlimited, you can read for FREE! For those of you who prefer holding a real book in your hands, The Eighth House is also available in paperback. 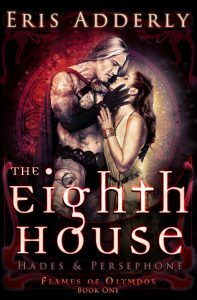 I’ve been working on this since last October, and the revised and expanded version of The Eighth House, is twice as long as the Literotica original, with more plot, more characters, more Underworld, and more Hades! New to my dirty mythology? 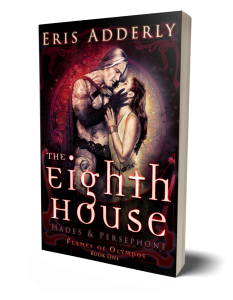 Romance readers can enjoy The Eighth House without any prior knowledge of Greek mythology. 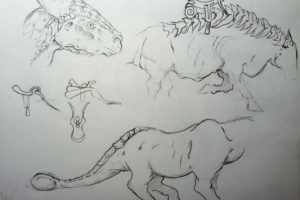 Just look at it as a romance in a fantasy setting, where there are immortals with incredible powers, and you’re all set! If you’re like me, however, and have a love for, and familiarity with, the ancient myths, you’re going read my version of the Hades & Persephone tale and have at least one, “Hey, wait a minute!” moment, I assure you. I thought this would be a good place to let you know, lovely reader, that I have taken quite the healthy dose of creative license with the original mythology. I like to think of it as, “Sure, you know what the ancient poets wrote, but come let me tell you what really happened.” *wink wink* I hope you have as much fun reading all the twists and surprises as I had in writing them. And if you love Hades & Persephone, let me tell you … more books in the Flames of Olympos universe are coming. Want to know who could fall in love with Medusa? How did Hephaistos deal with Aphrodite’s promiscuous ways? Stick around, because I’m going to tell you. In lurid detail, just how you like it.